They come out of the East in search of wisdom, but found only strife. Now they have discovered that their homeland is no longer the refuge it once was, and that they ahve lost too much and gained too little. The wisest and most mystical of Garou tribes must now struggle to find its center and reclaim its heritage, before it falls apart. Is it already too late? 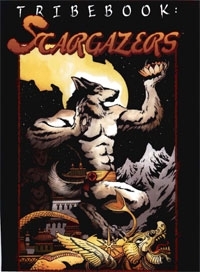 The Stargazers may have left the Garou Nation, but their lore hasn't been lost yet? Tribebook: Stargazer explores the hard choices the Stargazers have had to make, and the road that lies ahead of them - those that remain, and those that have moved on. Their Gifts and rites, their fetishes and totems are now all they all have left to their name - will it be enough?